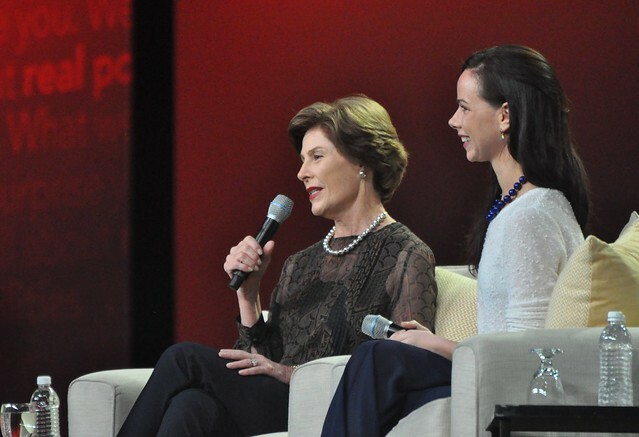 Former First Lady Laura Bush and her daughter Barbara Pierce Bush addressed civility and life after the White House during AARP Life@50+ in Boston this spring. Since departing the White House, the George W. Bush family has been relatively quiet about political life and hearing the mother-daughter presidential duo was refreshing. I wish everyone, no matter their political affiliation, would listen to what they have to say. Office of the President Past and Present – Where’s the Civility? I was in Washington, D.C., participating in inauguration festivities on January 20, 2009, the day in which the Bush family departed the White House while Barack Obama was sworn in as President of the United States. Although I was excited about hope and change, I was disappointed in the civility of the crowd. As George W. and Laura Bush departed by helicopter, the crowd began chanting “Nah nah nah nah, nah nah nah nah, hey hey hey, goodbye.” Whether you liked him or didn’t, there needs to be a certain level of respect for the Office of the President and I definitely did not feel or see it that day. 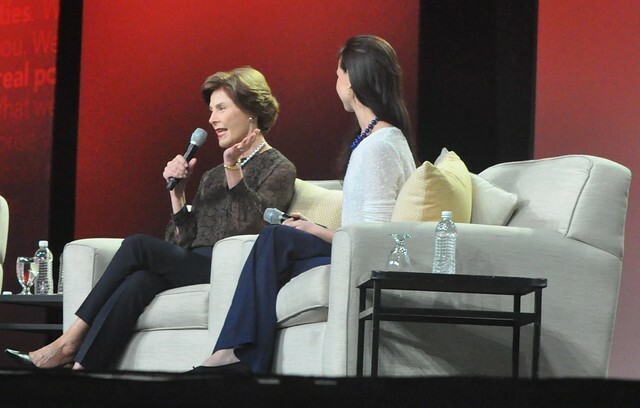 Fast forward to May 9, 2014, where journalist Soledad O’Brien facilitated the conversation in Boston with Laura Bush and Barbara Pierce Bush. She asked what life was like in the White House. “Of course it was stressful but it was also fun and it’s a huge privilege to have the chance to live in the White House. We had, of course, an advantage that the only the John Quincy Adams family had before us, that is we knew the White House very, very well,” Mrs. Bush said, explaining her family had stayed in the White House when George H. Bush was president. There needs to be “more civility with each other in politics,” Mrs. Bush told the AARP Life@50+ Boston audience, May 9, 2104. “It was difficult to see the person you love characterized by the media,” the former first lady said about the media’s coverage of the former president. Mrs. Bush further explained how political life in Washington was not like it is in Texas. When President Bush was the Governor of Texas, she explained, elected officials of opposing parties were more accessible for him to meet with because his office was located where their offices were. Because of this, there was a friendly rapport. Compared with the nation’s capital, the White House does not offer the president the same accessibility to representatives and congressmen. Can you think of a former U.S. president who has NOT criticized their successor? That’s reflective food for thought. “What’s the number one issue facing women around the world?” Soledad O’Brien asked. The audience laughter and Mrs. Bush clarified her response. She gave examples as Afghanistan women being denied education, the horrific kidnapping of teenage girls in Nigeria and internationally, some cultural beliefs are destructive to women. Pink Ribbon Red Ribbon provides healthcare services to prevent, detect and treat breast cancer and cervical cancer in Sub-Saharan Africa and Latin America. 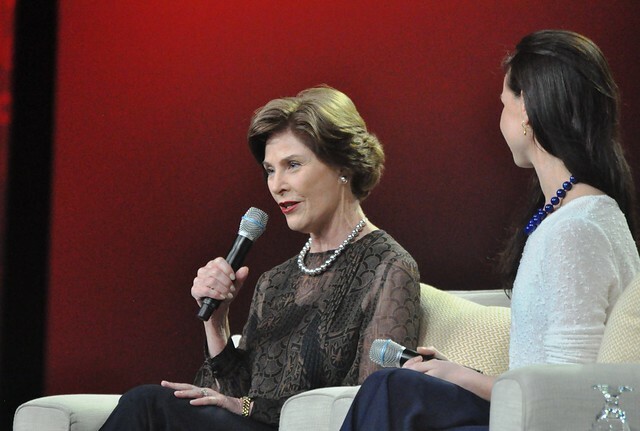 “Take advantage of your life as it is and walk on the beach every chance you get,” Laura Bush said to the AARP Life@50+ Boston audience, May 9, 2014. “George believes freedom is an instinct and desire for everyone,” the former first lady told the audience when discussing the Bush Institute’s focus on human freedom. She explained how the 43rd recently met an escaped prisoner from North Korea who was born in the prison. This person did not know what freedom was yet had the desire and courage to escape. Did you comprehend that? Someone who was born in prison had the instinct to escape to freedom. In addition to global health and human freedom, the Bush Institute focuses on education reform, economic growth, military service and women’s initiatives. “George says she’s just continuing the Bush family tradition of warm relations with the media,” she said of daughter Jenna Bush Hager in reference to her job with The Today Show. Bush Hager is also mother of their first grandchild. Thank you Mrs. Bush for showing me the definition of a class act. Be sure to read how President George W. Bush helped me make my peace. Image Credit of Me with President George W. Bush: www.robertpopephotography.com. Disclosure: This post contains affiliate links to support this blog, my traveling habit, and my special needs dog.